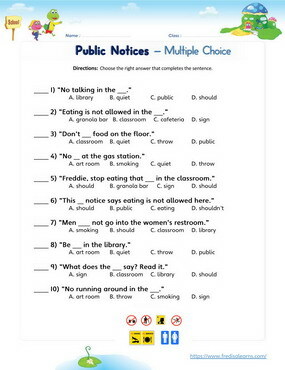 Teach ESL/EFL learners how to read public notices using the imperative mood and imperative sentences. The imperative mood is a verb form which is used when giving instructions, advice, commands or making requests. Imperatives are usually formed by using the infinitive form of the verb without ‘to’. Negative imperatives use ‘do not’ or ‘don’t’. Since imperative sentences do not generally sound polite, this lesson also teaches students to translate imperative sentences into fuller more polite sentences using modal verbs like ‘should’ and ‘be allowed to’. In imperative sentences, the subject of the sentence is not always clear. 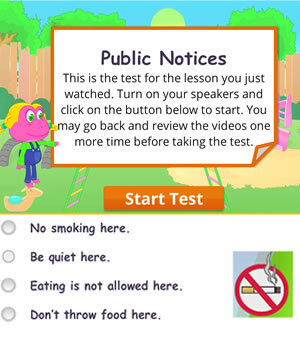 This ESL kids lesson also focuses on forming authoritative phrases starting with ‘no’. The worksheets below are useful for offline and classroom activities. 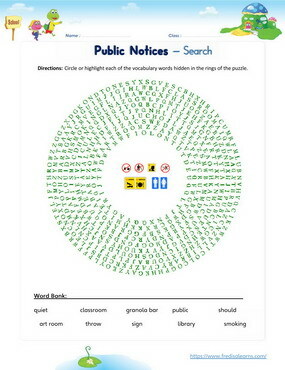 These printable exercises directly correlate with the above lesson 'Public Notices'. Every worksheet comes with an answer sheet on the second page for educators. On rare occasions Freddie becomes the bad boy and today is one of them. Miss Ann walks into class to find Freddie eating his granola bar at the desk. 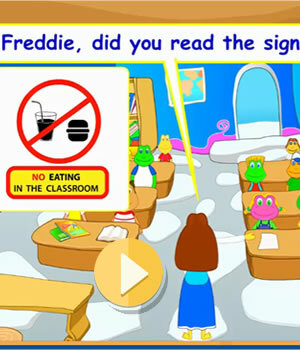 She tells Freddie not to eat in class. She points to the sign on the board. It says eating is not allowed in class. Then, Miss Ann takes the class to the library and shows the children the signs. The students get together and start making rules for different places in the school. 1. Be quiet in the library. 1. You should be quiet in the library. 2. No eating in the classroom. 2. Eating is not allowed in the classroom. 3. No smoking at the gas station. 3. Smoking is not allowed at the gas station. 4. No running around in the art room. 4. You shouldn’t run around in the art room. 5. Don’t throw food in the cafeteria. 5. Throwing food is not allowed in the cafeteria. 6. No talking in the library. 6. Talking is not allowed in the library. Freddie: This is so yummy. Ms. Ann: Freddie, are you eating in my class? Ms. Ann: Freddie, did you read the sign? Ms. Ann: Class, this sign says there is no eating in my classroom. You have to read the signs that are posted when you go into a public place. Sally: Like where, Ms. Ann? Ms. Ann: Why don’t we take a trip to find out? Ms. Ann: Freddie, will you read the sign? Freddie: It says that if you aren’t wearing shoes, you won’t be served. Ms. Ann: Why is it important to read that sign? Sally: So you can put shoes on if you need to. Ms. Ann: We have more signs near the bathroom. What do they say? Ms. Ann: It’s very important to read this sign, what would happen if you didn’t? Freddie: You’d go into the wrong bathroom! 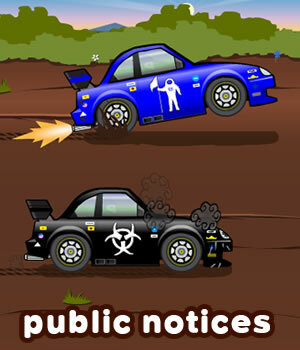 Ms. Ann: Class, I would like for each of you to make a public notice for us to put around the school. Sally: That’s a good idea, Freddie. It’s important to be quiet in the library. Freddie: That would be very dangerous! It’s a good idea to tell people not to do that. Freddie: That’s good! I will eat my granola bar there next time, but I won’t throw it.